Cozy Chicks: Take A Chance On Me! I really have no idea why the lyrics to "Take a Chance On Me" is running through my head and out my fingertips. Maybe it's because I feel a little like Sophie's author friend Rosie in Mama Mia. Taking my own chance, reaching out to you. So here's what started it. 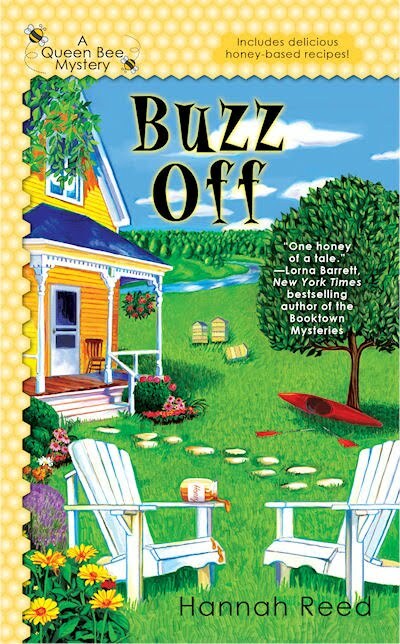 I've been waiting for the September 7th launch of Buzz Off every since the idea first came to me. At least two years ago, if you count selling the proposal, the time to write it, all the steps that go into production. Then one of my facebook friends (love them!) said she picked up her copy a few days ago in New Hampshire. What? Really? So yesterday my status mentioned that fact. And others started responding. Apparently, Amazon claims they are shipping on the 13th, 6 days late, which I can't believe. Then someone spotted Buzz Off at Books A Million. Another friend pre-ordered through Barnes and Noble, got her copy last week, and read it already. Okay, then, exactly when should I start celebrating??? Because won't most booksellers wait until the day after Labor Day to put them out? I could start right now and go right through the long weekend into next week. And beyond. While I make that important decision, keep your eyes peeled for Buzz Off. It's on pre-order from Amazon! Mine is on pre-order from Amazon. Strange that you have a Sept 7th on sale date. But really, that date means that all the stores should have their copies by then, but stores can start selling the books as soon as they arrive. Only when it's a lay down date do stores have to wait. I don't know any store that would hold a mm until the sale date. Deb, please remind me (and the rest of your adoring fans) about your contest for this book. Thank you. Thanks everyone! Shirley, the contest was a pre-order and it's over now. Personally I think you should celebrate right through the 13th. This is a big deal! I picked up my copy at our local Borders on Monday. It is working its way up the short stack by my bed. I'm looking forward to it because I've enjoyed all your other books. Hey, you got published, make it a never ending party! I'm on pre-order at Amazon and am really looking forward to the 7th! And, I agree with Rural View, party right on through! I've had a copy for two weeks, found at a small local store that sells new and used books. I don't know about the local Borders, but B&N never puts out the new releases until the release date, and sometimes there are books that are supposed to be on the shelf a certain day and aren't. Was that song on TV or something recently? Because I've got to tell you I was outside washing my vinyl siding this morning and was humming that very song! I'm looking forward to it, Deb! I'll be making a special trip to the bookstore on the 7th for both Buzz Off and Scoop to Kill. I had forgotten how much I loved ABBA back in the day until I decided to watch Mama Mia. I am now looking for it on DVD. I have your book on pre-order with Cynthia at High Crimes Mystery Bookshop in Boulder CO. Can't wait til next week to get it!! Congrats wherever and whenever! This is a book people can't wait to read. I have pre-ordered the eBook for my Nook from Barnes and Noble which is said to be available Sep 7. Amazon says it'll be delivered on the 7th. We'll see.